A fast lunch with summer’s bounty: just-picked tomatoes and homemade pesto. 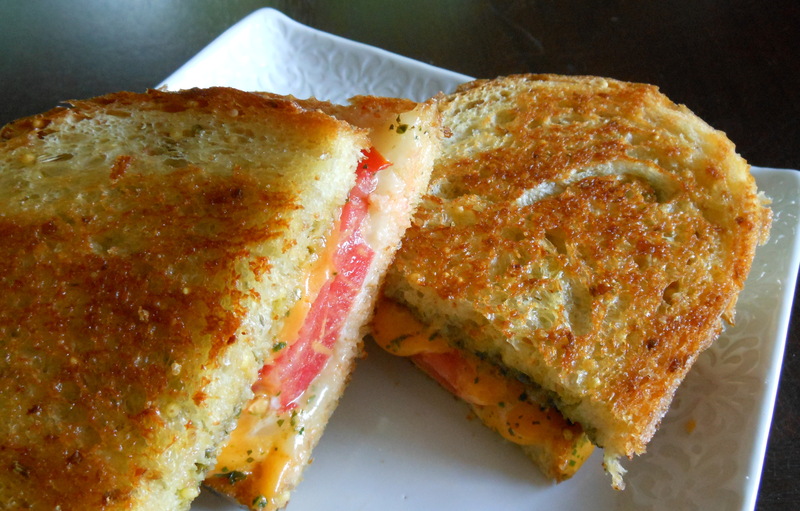 I grew up eating grilled cheese and tomato sandwiches. Luke is a huge pesto fan; his go-to snack or quick lunch is grilled cheese with pesto-slathered bread. The combination is summer on a plate. Our tomato plants are prima donnas this scorching summer, thriving one minute and drooping from lack of moisture the next. But they are managing to produce some tasty fruit. The basil plants, on the other hand, are loving the heat. I’ve cut them back ruthlessly three times now, and they shoot right back up in no time. We now have a goodly stash of pesto in the freezer, and I should get at least one more batch. Pesto is more of a process than a recipe. Put a clove of garlic and some nuts (I often use walnuts, but pine nuts are traditional) in the bowl of your food processor. Add a good glug of olive oil and give it a whir. This preliminary purée ensures that you don’t bite into a hunk of raw garlic later. Add handfuls of clean, dry (via salad spinner) basil leaves and pulse again. Keep adding basil and oil and puréeing until the texture looks good to you. Add a pinch or two of salt, a few grinds of pepper, and a few tablespoons of grated parmesan. Taste. I end up using about 4 cups basil leaves, 1 big clove garlic, 1/4 cup nuts, and about 1/2 cup oil. I also like to add a small handful of parsley and maybe some mint. When it’s done, scoop some into a jar, slap on a lid, and keep it in the fridge for about a week. Put the rest into an ice cube tray and into the freezer. After a few hours, pop out the cubes and store them in a freezer bag. Each cube is about 2 tablespoons. Thickly slice the tomato. Slice the cheeses thinly. Spread half the butter on one side of one slice of bread. Spread the pesto on the other piece of bread. I am a freelance editor with a specialty in cookbook editing. I've written two small cookbooks (50 Best Sundaes and 50 Best Cookies) and have edited more than 200. Despite my immersion in recipes, my favorite way to cook is to see what's in the fridge and wing it. I live with my husband and two dogs in rural Wisconsin. Husband (Tom) and son (Luke) are talented cooks themselves. All the photographs in this blog are my own creations. I'm a neophyte in the world of food photography (as if you couldn't tell), but I still claim blushing ownership of the pix you see here. If you want to reprint them (I can't imagine why), please give credit, if for no other reason than to pass on the blame. This entry was posted in main courses and tagged basil, cheddar, cheese, monterey jack, pesto, sandwich, tomato. Bookmark the permalink. Your photos are absolutely beautiful! This one especially caught my eye. Being able to make something simple like a grilled cheese jump off of the page isn’t easy and you’ve certainly mastered the art of food photography. Thanks for the follow 🙂 I really enjoy reading your recipes and hearing your stories and seeing your great pictures! Our styles are very similar–on the healthier side without actually being considered “healthy food.” Love it! Looking forward to drinking coffee tomorrow morning when I’m not at work and really getting to read some of these recipes! PS. 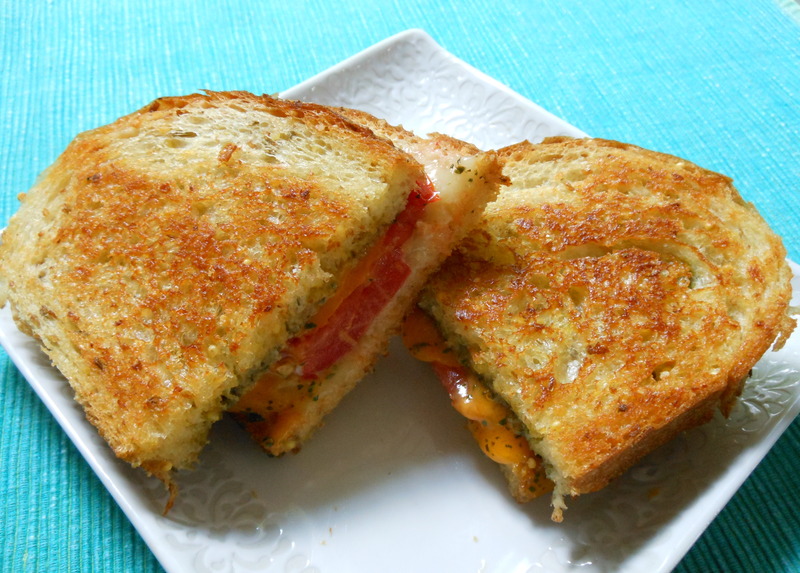 Pesto on grilled cheese is my FAVORITE. Wilmington's source for light, local, healthy eats. ...a little silly, a little sassy, a LOT tasty! I grew up at the knee of storytellers. Old men in bib overalls mesmerized me with animated stories about life. Porch Thinkin' addresses several of the passions in my life: writing, storytelling, and my love of the bow and arrow to name but a few.